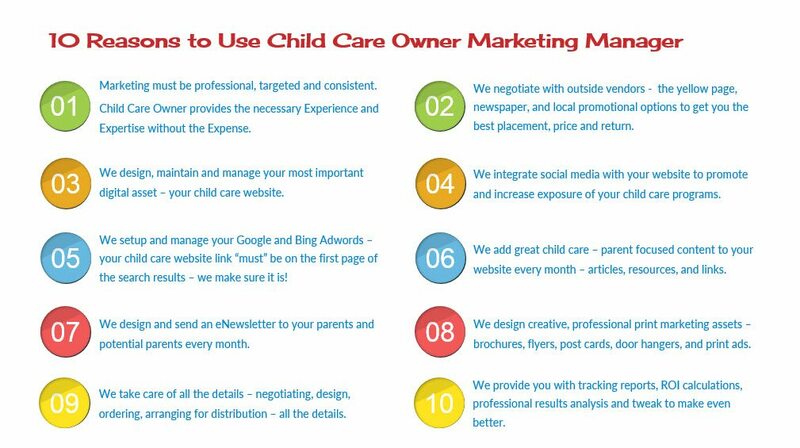 When it comes to marketing, many child care business owners are not sure where to begin. Should you put more money into local advertising – maybe an ad in the local community parent magazine? Alternatively, would a larger yellow page ad be better? What about marketing options available on the internet? The questions are many and often the answers are hard to obtain or confusing. 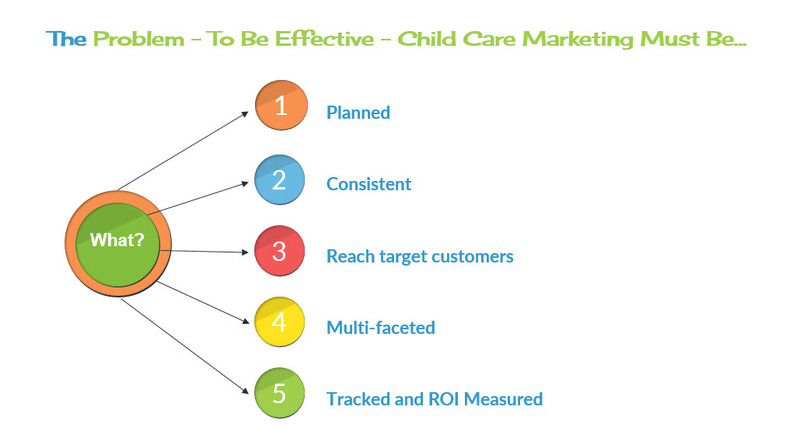 However, the success of a child care business is often directly tied to the effectiveness of its’ marketing program. Often funds available for marketing are limited thus making it very important to guess right. That is where Child Care Owner comes in. As your Marketing Manager, we will analysis your entire marketing program – yellow page ads, local newspaper ads, local events participation, internet marketing, social media marketing, direct mail – everything you are currently doing to promote your child care business. Then, we will work with you to take the marketing dollars you are already spending and reallocate them to create the highest return for your money. We take care of everything including taking care of advertising contract reviews and negotiating on your behalf for better rates. 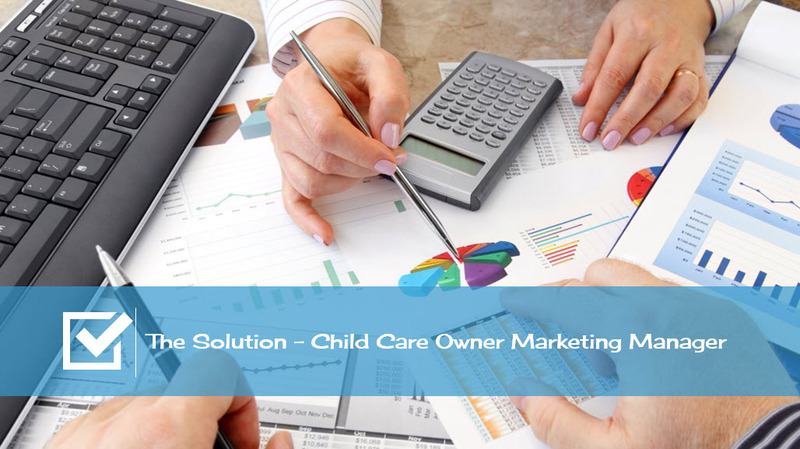 Your Child Care Owner Marketing Manager will work with you to develop a yearly plan of all marketing activities, help implement the plan and track results. Efficient, Effective Child Care Marketing! Maintaining enrollment year round requires, consistent, multi-faceted marketing designed to reach your target customer, deliver your message and result in full enrollment in your child care business year round. Marketing must be consistent and implemented throughout the year not just when enrollment drops. Marketing must focus on reaching target customers. Marketing must be multi-faceted including – the internet, social media, direct mail, professional branding, etc. If you can measure it – you can improve it! Systems to track and measure the results of your marketing is essential to improving effectiveness. Child care owners’ time is consumed with managing teachers and staff, meeting with parents, monitoring finances, ensuring compliance with state licensing requirements – and solving all those little unexpected daily challenges so common in every child care business. 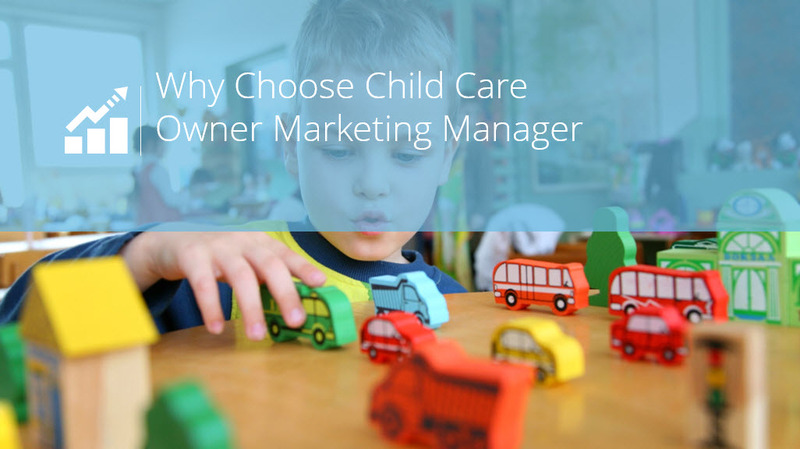 Child Care Owner Marketing Manager Program is the answer. As your Marketing Manager, we will analysis your entire marketing program – yellow page ads, local newspaper ads, local events participation, internet marketing, social media marketing, direct mail – everything you are currently doing to promote your child care business. Together, we will create an annual marketing plan and budget. 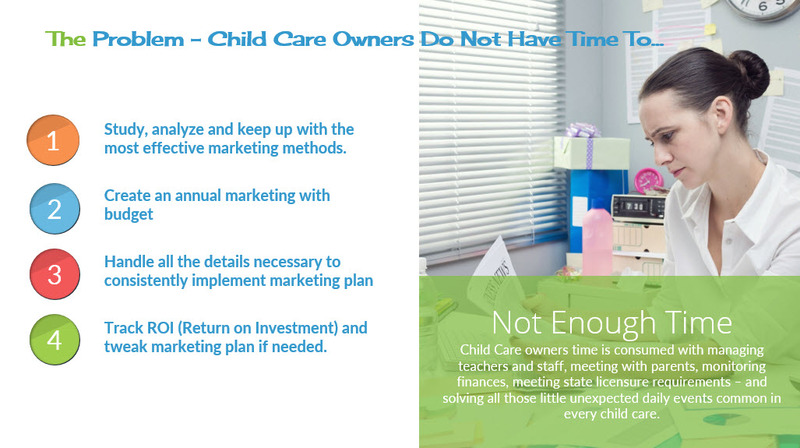 And the best news – Child Care Owner takes care of implementing the marketing plan and all the details – all year long. And what do you do? Well, you focus on running your child care business and leave the marketing to us. Think about it; wouldn’t be great to have your own Marketing Manager? Call us today to learn more 1-336-645-9007.